Digi-buddies is an innovative project with Lambeth Council that recruits volunteers with strong IT skills to support residents with online activities. This includes setting up email accounts, applying for jobs, using social networking sites, and buying goods and services. The scheme is holding a special event this week, December 16. The scheme takes place at local venues such as community centres and libraries, with sessions being run on a drop-in basis that are freely available to all. By increasing awareness of the advantages of being online and providing an accessible platform for local citizens, the project hopes to ensure that no one is excluded from using digital technology whether due to a lack of experience or skills. 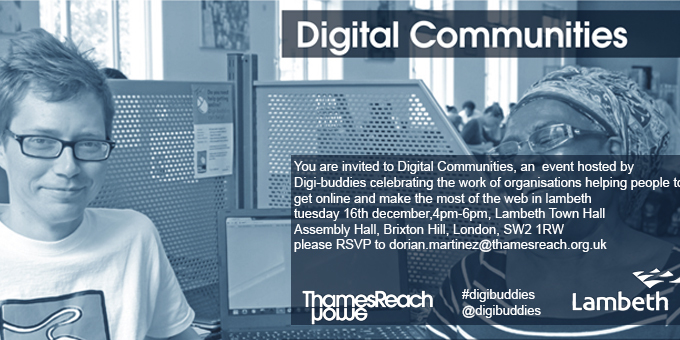 If you would like to attend a Digi-buddies session please call 0203 691 5111. Alternatively, if you would like to volunteer and help others in the community to take their first steps online, then please visit the website at www.digitalskills.com/lambeth where you can download an application form. Project Co-ordinator Dorian Martinez was representing Digi-buddies at the recent Open Event of the Living Well Network, hosted by Mosaic Clubhouse. The event, which is held on the last Thursday of the month is a great way for staff, service users and carers to find out what’s on offer through the Network.